Baenlin is an aging Bosmer pilgrim living in Bruma together with his man-servant, bodyguard, and friend, Gromm. Apparently he has made a few enemies as he's the target of a Dark Brotherhood hit. Or perhaps it is his assets, coveted by his nephew Caenlin, that lead to his tragic accident. In any case, Vicente Valtieri wants to see him dead, so he hands the contract over to you. Baenlin lives his life at ease and feels perfectly safe with Gromm at his side all day and night. He wakes up in his upstairs bedroom every day at 6am and heads downstairs for a three hour breakfast while occasionally chatting with Gromm. Once full, he will head back to his bed for a two hour nap. He gets up again at 11am and wanders around on the second floor until his lunchtime at 2pm, which he will take in the dining area on the first floor until 7pm. At that time, he will go take a seat in his favorite chair, never even thinking about the dangerous minotaur head that hangs right above him. He relaxes in the chair until 12am, when he heads to bed. As he is very well-off, his clothing is upper-class: a pair of blue suede shoes and a blue velvet outfit. He carries around his house key and a considerable amount of gold. After Baenlin is crushed by the minotaur head, his nephew will be quick to take over his inheritance and when approached, he does not seem very sad about his uncle's demise: "Maybe you knew my uncle. Baenlin? He died recently. Stuffed head fell on him. Very tragic. Well, goodbye." Also, the Black Horse Courier will print a special edition on the incident, in which both Caenlin and Gromm are interviewed. After the tragedy, Gromm relocates to Olav's Tap and Tack, where he drinks twenty four hours a day and can be heard mourning about the loss of his friend: "Baenlin... Oh Baenlin... I loved ya, old man. I loved ya... But I couldn't protect ya... Oh Baenlin! Waaaahhhhh! [sobbing]" The citizens of Bruma will feel sorry for the Nord: "Poor Gromm. I wonder what he'll do now that Baenlin is dead. Serving that old man was the joy of his life, or so I've heard." Others will be shocked about Baenlin's untimely demise: "Oh, have you heard? Old Baenlin is dead! They say he was murdered! Right in his own home! ", "Oh, have you heard? About old Baenlin? It was a horrible accident. A stuffed minotaur head fell off the wall and crushed him to death! Tragic...", "Old Baenlin is dead! I hear it was a horrible accident. He was resting in his chair and BOOM -- a stuffed head fell on him!" and "Is it true what they're saying? Is Baenlin really dead?" 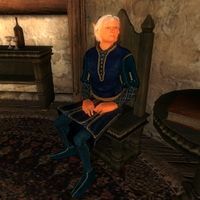 Additionally, if you completed the quest without Gromm noticing, Nords in Bruma will hand you the edition of the Black Horse Courier with the words: "Haven't you heard? Baenlin's been killed! The Black Horse Courier has a special edition with the story. Here, take my copy." Baenlin is actually killable before the quest has begun. If you kill him before the quest is given to you, you will forfeit the bonus, just as if you had waited for the quest, but simply killed him with your weapon. Melisi Daren was previously employed by him. It was she who stuffed the trophy on the wall. Esta página foi modificada pela última vez à(s) 08h57min de 16 de outubro de 2014.